For the tomato salad: Combine the onion, garlic, sugar, extra-virgin olive oil and some salt and pepper in a large serving bowl. Stir well to combine. Add the tomato, stir again and set aside. To serve: Preheat the broiler to hot. Brush the cut sides of the ciabatta with some extra-virgin olive oil. Grill for 2-3 minutes, turning once, until golden-brown and lightly charred. Remove from the grill and leave to cool. Add the basil leaves to the tomato salad and stir well. Adjust seasoning with more salt and pepper as needed. 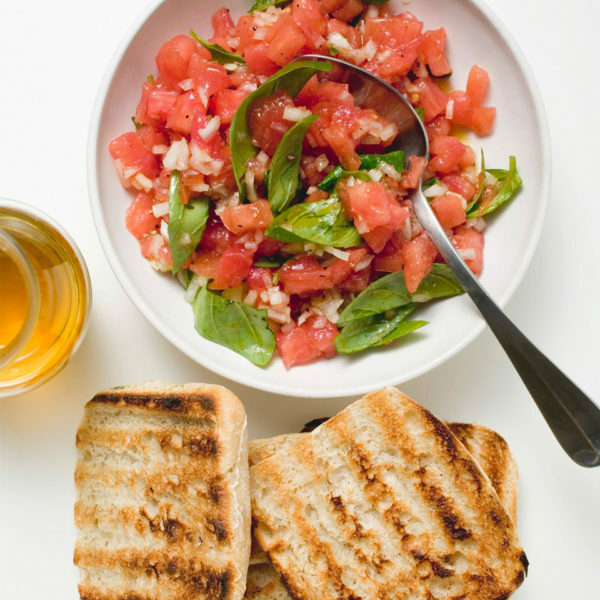 Serve the salad from the bowl with the toasted ciabatta bread on the side.